Giggles was made by Ideal from 1967 to 1969. As you can see,I have two. One has had a haircut. ...and when her arms are brought together in front of her, there is a shaking inside her, and she makes a giggling sound,as her head tilts to the side, and her eyes look to the opposite side. Do it again, and her eyes roll the opposite way. Some people find the eye thing a little creepy. Sometimes they don't both roll properly. The long haired girl's eyes are often wonky.There's just something a little off about them even when they roll the right way. There are speaker holes in the stomach. Her face is sweet,with green eyes and dimples. She makes a cute little boy though,don't you think? I hadn't thought about that until I was redressing her for this post.Trying to find a warm fall outfit for her I ended up with the sweater and pants combo that ended up making her look like a boy. Giggles originally came in black sandals and a striped shorts and shirt outfit.There were variations however.There were different prints, and some of the outfits were double knit and some were cotton. I think the cotton one is rare, but I know it exists because I've had one. She also came as a blonde or a red head Caucasian, or an African American. 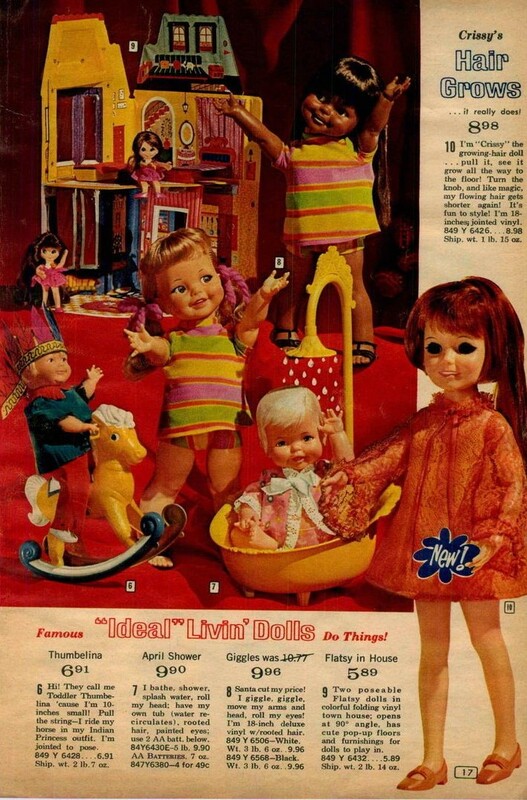 As you can see, the dolls in the ad are wearing different clothes from the doll above on the box lid. There was also a Baby Giggles. This picture is for reference, and is not mine. I will be glad to remove it if asked. Currently a new Giggles remake is being offered by the Brazillian company Estrela,as part of their 80th anniversary celebration. Technically she's called Gui-Gui in Brazil. Unfortunately they are only being sold in Brazil,and are not available for purchase by those outside the country. Kewpie83 at the blog Confessions of a Doll Collector's Daughter managed to get hold of one via collaboration with a Brazilian reader. She's done a review of Gui-Gui you can check out HERE. Personally, I got pretty excited by the thought of a new version of Giggles, but as with the Mrs. Beasley redo,I didn't care for this new Giggles. 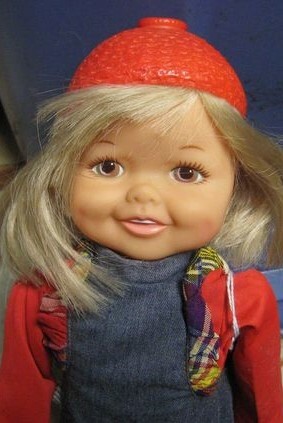 But as for the original Giggles, I could not resist her cute face. Cute as these guys are,someday I do hope to find a red head. 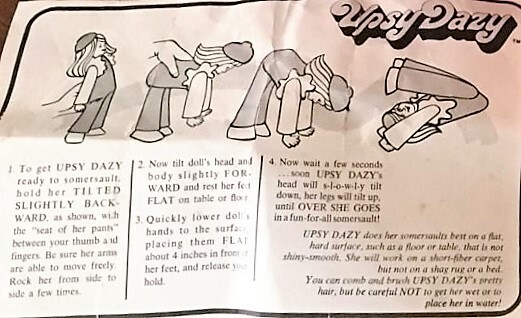 Giggles got an unintentional sister in 1973, when Ideal used the Giggles head sculpt, or one very like it,for the Upsy Dazy doll. 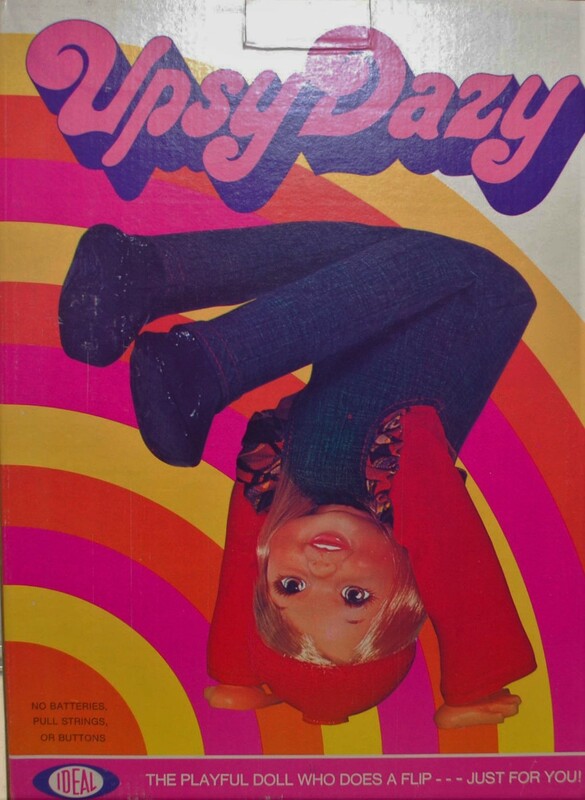 Upsy Dazy has painted eyes instead of inset eyes, like Giggles. Upsy Dazy was 14" tall. 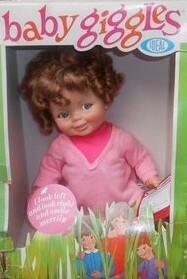 She was sort of like Baby Tumbles Surprise. That's it for today. I hope you enjoyed this visit with Giggles. 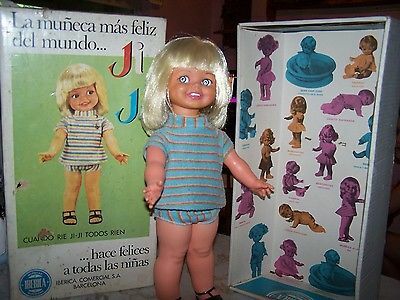 Tomorrow is Shrunken Saturday, so we'll be looking at a miniature doll. See you then. Wow, they're adorable! I love their faces and dimples. My favorite is the cross-eyed photo. I had never heard of her before. So cute! 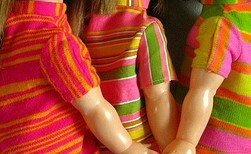 Indeed adorable, my first thought was: how nice that these dolls come in both boy and girl version." Boy with rosy cheeks from playing outside in his warm jumper. She does really make a cute boy!